Now that I had a new pack of masking tape, I could get on with finishing the painting of the B-25. I just needed to get the olive drab on the nacelles along under the wings. I then had to correct some of the D-Day markings. Once I had done this, I had to go around the plane touching up some of the over spray. Once, that was all complete, I could start putting the decals on. Oh, firstly, I gave it a quick overspray of Johnson's Klear. I now have to come clean about the decals on this kit. It seems that I was a bit sloppy in my choice of decals vis-a-vis the Mitchell that I had bought. 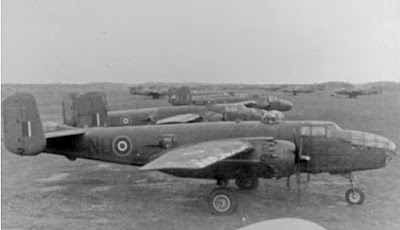 I wanted to do a Mitchell in British markings (and in British camo but that wasn't to be as it seems that even British Mitchells flew in olive drab over neutral grey) and the only sheet that I could find was for Dutch B-25s. It was when I was checking out the decal placement that I realised that we were talking different models of B-25. Here is the body of the model as it currently sits with the decals applied. This is the decal instruction sheet. Oh, look - Mitchell II - Mitchell IIs were B-25Cs and Ds! I did a search and found the following image of a Mitchell II. I used this to place the decals. If I had seen this earlier, I wouldn't have put the D-Day stripes on to the plane. As it is, I think that I should have painted out the area behind the squadron code. Still, it is done now, so I will keep going. I am just going to carry on. I have painted and decalled the wings. Now, I have to put it all together which means fitting the waist guns,the undercarriage, etc. Unfortunately, the twin rear guns have been damaged. I knew I shouldn't have installed them yet. That is something that I will have to fix.